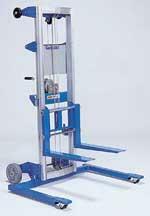 Manual winch operated forklift. Can lift 350 lbs. to 12'. At 154 lbs. it is very portable and can be carried down steps or into difficult access situations. Mount TV's etc. onto walls with this lift. Genie GL12 model. MAX HEIGHT 13' 9" WITH FORKS UP, 12' WITH FORKS DOWN, HEIGHT 7'7"
WIDTH STOWED 28 3/4", EXTENDED WIDTH 43 1/2", WEIGHT 154 LB. FORK WIDTH 20 1/2", LENGTH 22 1/2". OVERALL LENGTH 43"
* Please call us for any questions on our 12 foot mini lift forked rentals in Calgary, Alberta.